It doesn’t matter if it’s a regular car, and autonomous car, an Uber…there is no room on the streets. You’d need 56 lanes at rush hour. Today the Daily News published an op-ed from autonomous car consultants Levi Tillemann and Colin McCormick, who proposed that NYC rush to establish an elaborate — and subsidized — driverless taxi system to help move people when the L train tube under the East River shuts down for Sandy-related repairs. Vehicles would pick up and drop off riders in designated neighborhoods in Brooklyn and take them to and from mass transit hubs in Manhattan. Autonomous taxis would also be used for transportation within the borough. Today’s op-ed comes a few weeks after Uber floated a proposal to suspend taxi regulations so anyone with an empty seat in his or her car could play cab driver. “With enough participation, we could significantly reduce the 11,000 vehicles traveling over Williamsburg bridge and carve out space for BRT,” said Uber manager Josh Mohrer. Given the scarcity of street space and the volume of people who will be affected when the L is taken out of service — hundreds of thousands of commuters take the L every day — cars are simply not a serious option as a substitute. That’s why the MTA and DOT are looking at buses and bikes to handle the load. We already have a tried-and-tested system for moving large numbers of people between Brooklyn and Manhattan, and it doesn’t involve cars. 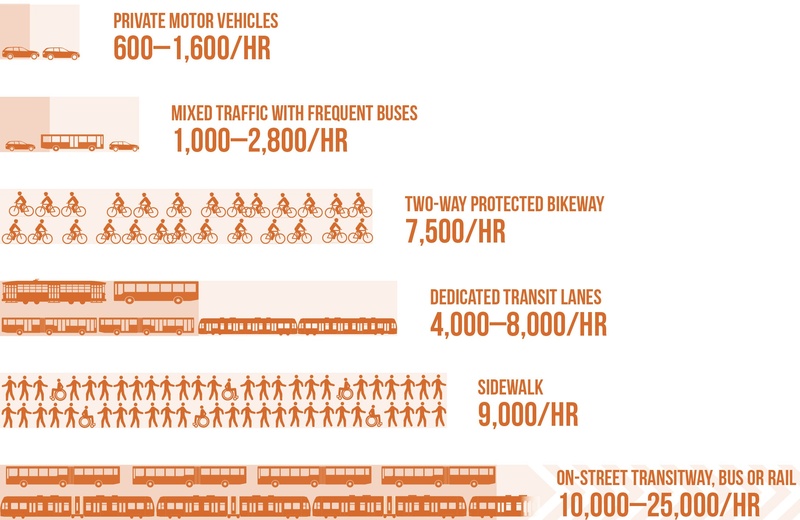 Allocating street space for more buses, biking, and walking is the solution that’s staring us in the face. It’s also the only one that makes sense. And don’t forget: The capacity of a single 10-foot lane (or equivalent width) by mode at peak conditions with normal operations. Uber and Lyft appear to be on a charm offensive the past few weeks, each trying their own way to advance their own long-term agenda – access to the urban for-hire market, minus the pesky regulations that today’s participants are subject to. Uber is promising that they’ll solve the L train crisis if we let them run “autonomous” (which does not necessarily mean “robot”). Lyft is promising to end private car ownership – in 10 years – if we give them the breaks they want…now, of course. A few months ago, I passionately defended Uber, being that (in NYC at least) they are regulated like any other car service. I saw them as just another way to order car service. An app instead of a phone call. Now, learning more about how they treat other cities where car service is regulated (like Austin) and what they’re trying to pull in NYC, I see them as less benign. 50,000 ride-sharing cars in NYC. And Uber wants more simply because it’s “more cars – more money for uber” This is anything but benign. Maybe not. But a host of cars driving into Manhattan for 18 months might very well solve the problem of auto commuters being willing to support better subway service for other people. 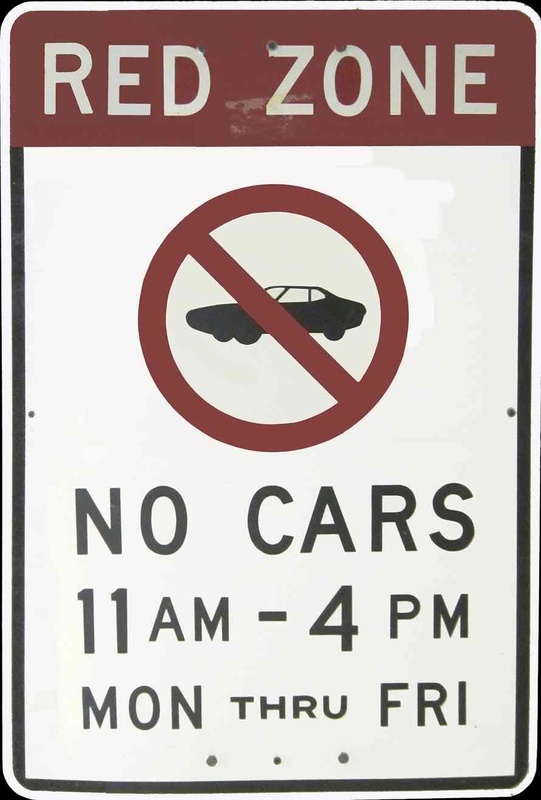 Why don’t we propose opening up placard parking in Manhattan to all comers during the shutdown? Normally NOT a fan of anything from the Manhattan Institute, but this… Technology we don’t have yet!!!???? Let me play! Cars are still going to be driving over the Williamsburg Bridge. Those cars should only be multi-passenger, shared vehicles. There is is clearly a place for companies like Uber and Lyft in this plan. Those companies can be part of the solution here. And they are a lot more nimble, creative and willing to try things than the MTA or DOT. I vote for dolphins with saddles. Uber and Lyft’s model fails once you get beyond a few passengers, and cars with only a few passengers are no better than private cars in terms of congestion, capacity, etc. So Uber and Lyft basically have nothing to offer. Swan boats! Can a hundred amusement parks be wrong? It seems likely that cars will still be allowed on the bridge, but car pool restrictions could be put in place. For many people, Uber/Lyft’s ride pooling features are actually more efficient than the old-fashioned way of trying to figure out whom to carpool with, or the old-fashioned picking up of hitchhikers. Therefore, these companies could actually offer something. I only hope the authorities will finally realize that the driver of a taxi shouldn’t count for car-pooling purposes. I cringe whenever I see a taxi with one passenger on a “two person minimum” car pool lane. A taxi with one passenger is transporting one person. The driver is effectively part of the car. We should put car pool restrictions in place on every entry point into Manhattan for the duration of the tunnel repair. When people see the world didn’t end because of it, then we might have political support to make such a restriction permanent. The first step is to create dedicated bus lanes and HOV restrictions. Then we can talk about the best way to facilitate ride sharing (not ride hailing). We all know how the “let it burn” crowd will be voting come November. Report: 98 Percent Of U.S. Commuters Favor Public Transportation For Others. Ideally, those 8 new bridges would be made out of plastic, so that they could be scrapped and recycled 18 months later since they’ll no longer be needed once the L train is running again. Sure. But shoot them out of circus cannons. Think that’s better than a water slide ? Okay, dolphins with saddles, shot out of circus cannons, landing in water slides for a thrilling finish to your commute. I guess the water slide could discharge onto a giant trampoline. NYC’s Taxi Regulations Are Obsolete. How Should They Change? If Governor Cuomo is going to allow autonomous car prototypes to operate in real city conditions, he needs to insist on a prototype for how these vehicles will pay for access to public streets.